James Thomas Robinson Pastfield was the third of ten children born to John Robinson Pastfield and Elizabeth Olive Pastfield. On the 1911 census the family was shown as residing at "Olivedale", 286, Princes Road South, Exeter. James was at this time studying at University. His older brother John was a student of Theology, and his older sister Gladys resided at home. He had three younger siblings, Olive, Katherine and David, all of whom were at school. His other siblings are not mentioned on this particular census. Having completed his education at Exeter School, he then progressed to Keble College, Oxford where he graduated in 1913 with a BA Honours. Shortly after this he took a post as a teacher at Bloxham School. He lived at 25, Farndon Road in Oxford. Keble College had at the time of the Great War an active Officer Training Corps (OTC) and we know that James was a member of this when he was at Keble. The OTC was known at the University as “The Bughunters”, as the recruits spent many hours in Christ’s Church Meadows, performing endless rifle drills with nothing to shoot at apart from bugs and butterflies! A total of 996 men from Keble served during the Great War, with a remarkable 202 serving as military chaplains! James enlisted into the Army on the 13th August 1914, at a recruiting office in Exeter, as was commissioned as a 2nd Lieutenant into the 5th (Reserve) Battalion of the Middlesex Regiment, as a member of the “Special Reserve”. The Haldane Act of 1907, was introduced to reorganise the Militia regiments into a well-trained reserve of troops who could reinforce the regular Army in the event of a mobilisation, or provide a professional and well drilled force for the purposes of civil defence. Before this act came into force, civil defence was the responsibility of the Yeomanry (Volunteer Cavalry) and the reinforcement of the Regular Army was the responsibility of the Militia. The Yeomanry and Volunteers were amalgamated to form The Territorial Force and the Militia became known as the Special Reserve. A recruit in the Special Reserve was required to serve initially for a period of six years. During that time he would first of all complete a period of six months continuous military training, and after that he would have an obligatory annual training of 28 continual days, run alongside his normal working life. There is some confusion as to when James first arrived in France owing to an anomaly with his medals. In 2008, through an Australian medal dealer I was able to purchase James’s trio of medals, which included the 1914 Star, War Medal and Victory Medal. The trio of medals, (known colloquially as “Pip, Squeak and Wilfred” after a popular newspaper cartoon strip) were awarded in this form to all those who served between the 5th August and 22nd November 1914. This period of service was denoted by a clasp on the ribbon of the star, bearing these dates. Campaign medals to other ranks were issued automatically, whereas the families of officers had to apply for them. Mrs Pastfield duly did this in 1918 and her claim for the 1914 Star (also known as the Mons Star) was rejected, as the War Office stated that James didn’t arrive in France until the 27th November, meaning he should have been entitled to the 1914-15 Star instead! The trio of medals, which now hang in the Vallance Library at Bloxham, are named as issued, and the ribbon of the Star does bear the clasp. How did this happen? Perhaps the family purchased a medal privately after the War and added it to the collection, we will sadly never know. The medals which hang in the library are certainly genuine and from the right era. Whilst James was commissioned in the Middlesex Regiment, he found himself attached to the 1st Battalion the Northamptonshire Regiment, presumably as a replacement for the heavy casualties they had suffered in the opening months of the War. With British casualties running at almost 90,000 men in the first three months of the War, the Army was desperately short of trained officers. On the morning of the 21st December, the Battalion once again went into action again, presumably this would have been James' first engagement. The Battalion left Hazebrouck at approximately 7am, and following a four hour march, they stopped for rations near Le Touret. They marched a further 4 hours towards Rue de Bois, being guided by an officer of the 2nd Ghurka's, where they received orders to launch a night attack in company with the 1st Battalion The Loyal North Lancashire Regiment. Their objective was to retake trenches which had been lost to the Germans the previous night, about 1/2 mile south of Rue de Bois. The diary of the Loyal North Lancashires records that information about the exact location and number of Germans was "somewhat vague". At 7pm they attacked, the Northants to the north of the village, the Loyal North Lancs to the south. The men were carrying 170 rounds of ammunition, iron rations and were ordered to leave packs bheind. By this time, the night had fallen and the weather closed in, and the attack started in freezing rain. The two regiments attacked on a front of 300 yards with fixed bayonets. They immediately ran into heavy rifle fire coming from the edge of an orchard, and promptly charged the enemy. They managed in the next 3 hours to retake 3 lines of trenches and advance over 400 metres. The Germans counter attacked with bombs and rifle fire but successive attacks were beaten off. The 1st Northamptons took the brunt of the onslaught to the north of the position heading towards a road known as La Quinque Rue. From research, we believe that the orchard remains to this day and the current size and shape appear to match the description provided in the Loyal North Lancashire’s war diary. Five months later, another Old Bloxhamist, Francis Riddle (see 1915) was to die in these same fields, being killed during an attack immediately to the east of this orchard, during the opening stages of the Battle of Festubert. By 10pm, the trenches had been retaken but casualties were heavy, mainly coming from artillery fire located in woods to the east of Rue de Bois. The night remained wet and cold and the constant artillery fire prevented packs or rations being brought up. One can only imagine how miserable this must have been. The following account of what happened was provided by a soldier wounded in this engagement and was passed to the school. "We left Hazebrouck on the morning of the 21st in motor buses, and we went to La Bassée. From there we marched some 3 or 4 miles to some cross roads and we entered some fields. At about 6pm we were ordered to take some trenches. Our Captain has been wounded and we were hesitating, looking round for officers when Lt Pastfield and his young friend Lt Wainwright said "Come on lads, we'll lead you!" They did so, and shortly after our attack Lt Wainwright fell badly wounded. Lt Pastfield went on and after some murderous fighting we took the trench. The Germans got into a position about 15 yards away. Lt Pastfield was feeling faint from a wound he had received and a Lance Cpl begged him to go back and seek attention. He refused saying he needed to find Lt Wainwright. He went out to where Lt Wainwright lay, and reeling from lack of blood, he staggered and presenting an easy target, a German shot him through the head." 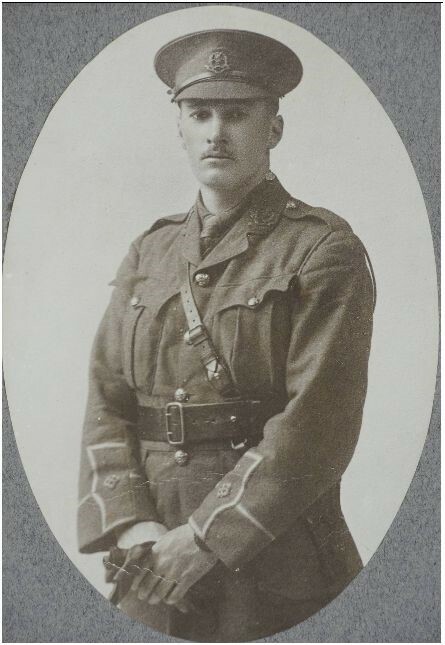 Lieutenant Wainwright, was in fact 2nd Lieutenant Godfrey Chaucer Wainwright, who died the following day from his wounds. The 1st Northamptons lost 3 officers and 60 men, killed and wounded during the attack on the night of the 21st. Further bad luck was to strike the Pastfield family when Joseph who was serving with the 5/13th Battalion the Middlesex Regiment was killed in action on 9th September 1918 in Palestine. James Pastfield's body was never found and he is commemorated on the magnificent Le Touret Memorial to the Missing, just above that of 2nd Lieutenant Wainwright. By kind permission of the Warden and Fellows of Keble College, Oxford.